Agnieszka Radwanska has moved up to second in the world thanks to her recent performance at Wimbledon, where she earned a trip to the finals, the furthest she has advanced in any Grand Slam event. It is the recent achievement in a string of performances in 2012 that has generated talk of a breakthrough and her first win in a major. As the top ranked woman who plays with Babolat tennis racquets, these accomplishments have undoubtedly excited the company brass and those who sell the product. She has won over many people who are eager to see what she will do next. Radwanska was born in Krakow Poland on March 3, 1989, growing up in a family well familiar with the sport of tennis. Her father is a tennis coach and her younger sister, Urszula, also plays the game. Agnieszka started playing at age four and developed into a world class player as a junior, winning the junior singles titles at Wimbledon in 2005 and Roland Garros in 2006. In 2007 she showed signs of great potential when she defeated Vera Dushevina at the Nordea Nordic Light Open. It was her first WTA title and also the first WTA title for a Polish player. When she defeated Maria Sharapova in the third round of the 2007 U.S. Open, many took notice. She continued to impress with a win over Svetlana Kuznetsova, ranked second in the world at the time, in the third round of the 2008 U.S. Open. 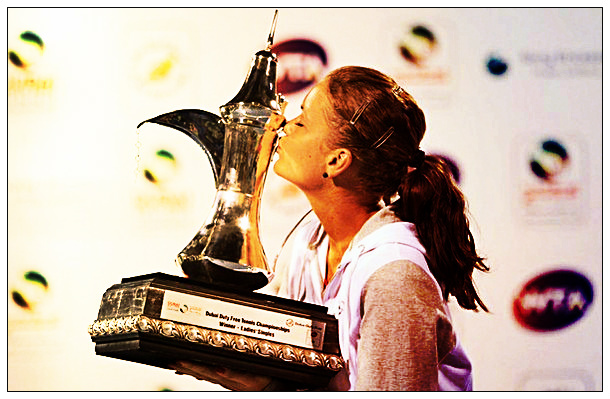 The 2012 season got off to a fast start for Radwanska with a win at the Sony Ericsson Open over Sharapova. In the first four months of the season, the only person she lost to was Victoria Azarenka. Radwanska continued her strong performances when she made it to the finals of the 2012 Wimbledon Championships, becoming the first Polish player to reach a Grand Slam final in the Open Era. It was recently announced that she will carry the flag for the Polish Olympic team at the opening ceremonies of the upcoming 2012 Olympics. It will be interesting to see if she is able to parlay her success into more lucrative endorsements of Babolat tennis racquets and other products. Although she lost to Serena Williams in the finals at Wimbledon, Radwanska seemed to have won over the crowd in the finals at Wimbledon and was featured in a Road to Roland Garros video on YouTube. The best way that you could describe Radwenska’s style of play, especially to those unfamiliar with the finer points of tennis, is to call it a finesse style where she uses the whole court and looks for an opportunity to sneak in one of her trademark drop shots. It is analogous to baseball pitchers who locate the ball and change speeds to keep hitters off balance rather than overpower them. The drop shot is very much like a pitcher’s changeup. Just has the pitcher uses a fastball arm motion but delivers a slower pitch to induce the batter to swing early on a changeup, Radwanska makes the drop shot look like a regular shot, fooling her opponent into expecting a deeper shot, only to hit the ball so it barely clears the net. Her opponent has to rush to the net before the ball bounces twice and even if she returns the shot, is usually so off balance and out of position that Radwanska can respond with a winner. She plays with Babolat tennis racquets (Pure Drive GT) and plays in Lotto footwear and clothing. 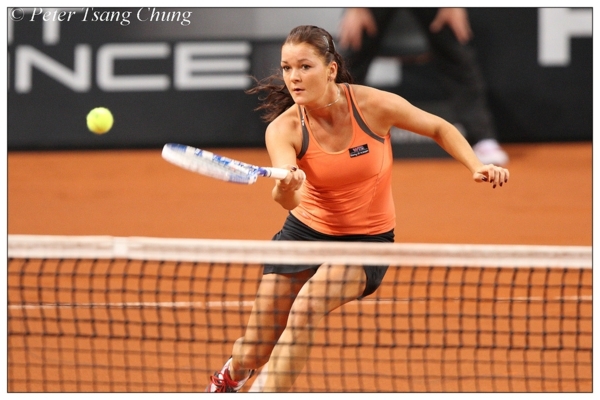 So what’s in store for Radwanska for the rest of 2012 and 2013? Will she be able to win her first major in the next 12 months? She’s obviously not fazed by tough opponents or big matches, but critics say her finesse style is something that power players like Serena Williams seem to take advantage of. She will probably have to find a way to beat Azarenka more frequently if she wants to win many majors. Whatever Radwanska does, Babolat executives and retailers around the world hope it helps them sell more tennis racquets.